Here it is, nearly Christmas, and I still need to post about Thanksgiving! I want to tackle what might be my favourite American holiday in two parts – the traditional dishes I’ve grown to love, and the super Aussie desserts I like to take along to represent the homeland! A good friend requested my pavlova recipe today so I figured the time was right to put it into the public domain. My first thanksgiving was two years ago, and I was lucky enough to celebrate it in full, decadent, family style. It was only about a month after I’d met the boy, so it was a little scary meeting his family at that point! But I survived to return for two more Thanksgivings, and I think the desserts I brought eased the way. Actually, I’m now expected to make pavlova for all family dinners, so it’s possible it’s the only reason I keep getting invited? 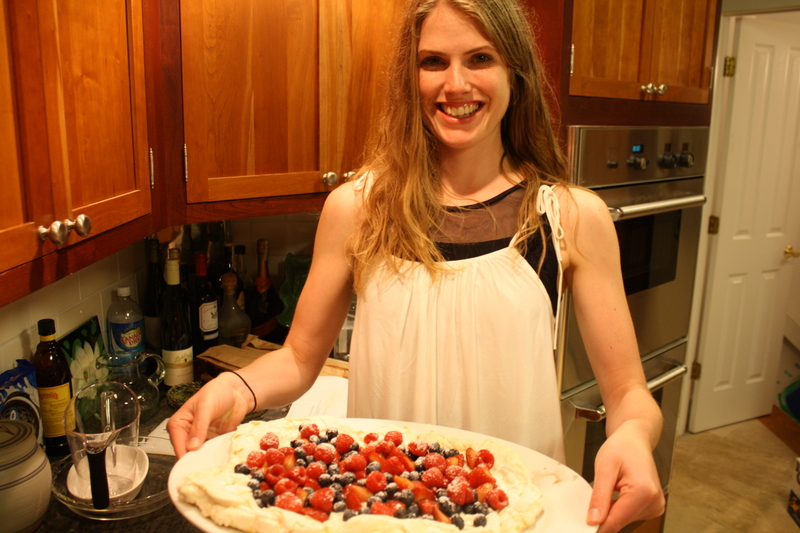 Seems funny that it took an invitation to the most American meal of all to prompt me to make my first pavlova. For the uninitiated, the dessert we affectionately know as pav is a deliciously light meringue topped with whipped cream and fresh fruit. There’s some contention about whether pavlova is Australian or New Zealander in origin, but it was apparently invented to honour the touring ballerina Anna Pavlova in the 1920s. These days it’s a summer staple, simple and light but still visually impressive and a decadent end to a meal. Plus it’s a perfect showcase for the season’s best fruit. In the US I usually use a mix of berries (strawberries, blueberries, raspberries) because they’re easily available and no one seems to know what a passionfruit is here. The classic combo would be passionfruit pulp, sliced kiwifruit and some mango. But you can use anything – juicy sliced peaches, chopped pineapple, I’ve even used apples and oranges in a pinch. 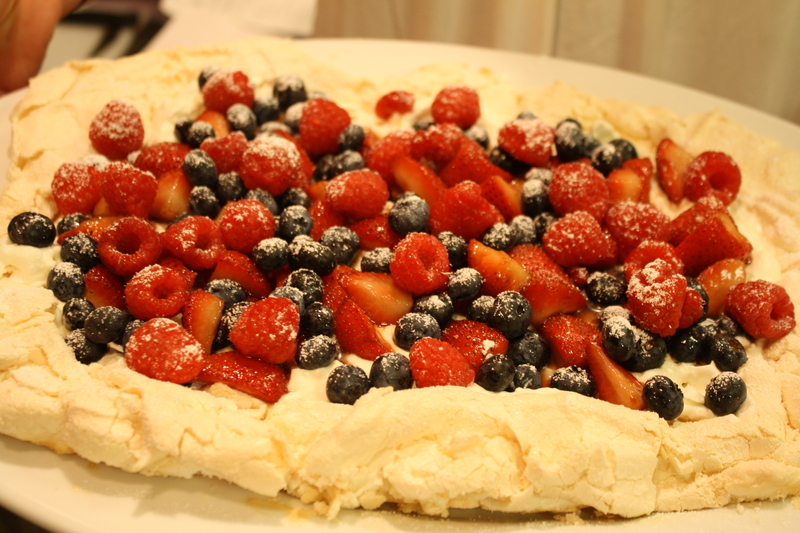 I’d always shied from trying pavlova because mum had put the fear of god into me about how difficult it was. And when I started researching recipes my fears were compounded by dire warnings about how easily pav can go wrong. But even though mine have never looked exactly the same twice, I’ve never had a complaint. There’s a good chance your meringue will crack, maybe it will sag a little in the middle. You know what? No one will care. You’ll slather it in cream and people will lap it up regardless. That said, try to take care when separating your eggs, make sure your bowl is clean and dry, and allow plenty of time for your pav to cool in the oven before you have to transport it anywhere. All these simple things will help your pavlova be the best it can be. Once you master the basic recipe you can get creative with your pavlova. The meringue mixture is quite sculptural and so you can have a lot of fun creating shapes and spikes – you could do individual round or heart-shaped pavs, or pipe the mixture in a spiral to create thin flat discs you can then stack with fruit and cream. My sister suggested whipping some cream cheese with the cream, and marinating the strawberries in balsamic vinegar; I was nervous but of course it was magnificent. You can add flavourings, like chocolate to the meringue; I’ve even seen food colouring swirled into the mixture to create gorgeous colour effects. It’s so simple. Egg whites and sugar. I know four whites doesn’t sound like much, but this will serve 6-8. Adding even one more egg white makes a monster pav! Maybe that’s what you want? Have fun! Preheat a slow oven – 130C (250F). Line a flat baking tray with parchment and draw a circle or oval for guidance if you like. Think a 7-inch circle for size. In a clean, dry bowl beat egg whites on medium speed until they make soft peaks. Keep beating, adding sugar a tablespoon at a time. Sprinkle cornstarch and vinegar over the mixture and fold in. Spoon and spread the meringue onto the baking sheet and shape it as you like. Create a bit of a wall around the outside (to hold in toppings when it’s cooked), the bottom can be thinner in the middle. You can also play around with creating spiky little peaks around the edges for a creative effect, or keep it smooth. Bake for 60-70 minutes. The meringue is done when the outside has pale creamy colour and feels firm to the touch, making a hollow sound when tapped gently. The inside should still be soft and marshmallowy. But your pav is still a delicate creature at this point, so don’t handle it much. Turn off the oven and let it cool gradually in there, with the oven door slightly open. Once cool, keep your meringue stored in a cool, dry, airtight place. Only add the toppings when you’re ready to serve, lest you end up with a soggy pav. Top with whipped cream – a cup of thickened cream should be plenty for this pav, add a little sugar or vanilla if you like – and your fresh fruit. PS – wondering what to do with those egg yolks? Maybe some lemon butter?